First exhibited at Hal Bromm Gallery in 1978, and later at John Weber Gallery in 1979. 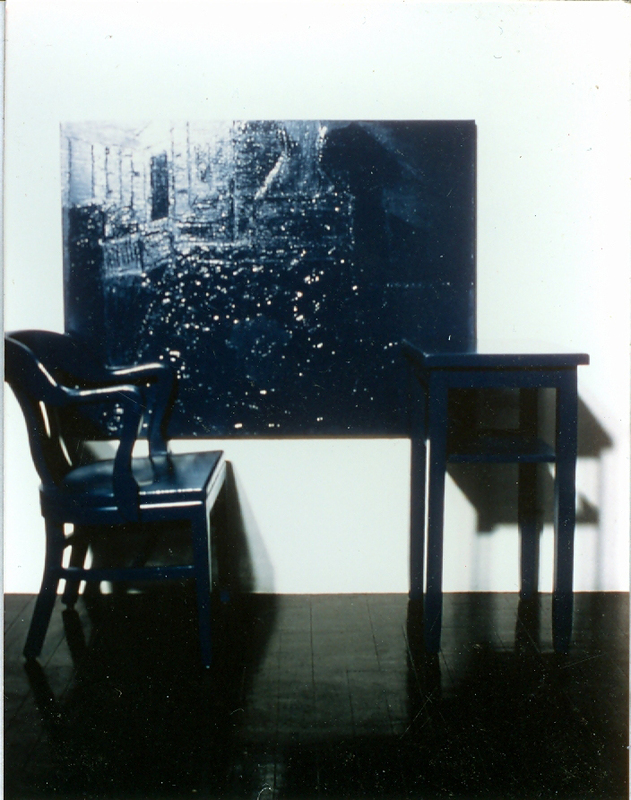 Four groups, each containing a chair, table, oil on canvas painting, and wall painting; dimensions variable. Each prototype painting in the Interiors series is comprised of two pieces of furniture—a chair and table painted in red or blue oil paint— arranged in front of monochrome canvases of the same hue. The image in each of these canvases is of the interior of a room delineated only with brushstrokes, and meant to be difficult to see in full at any one angle. The titles of each work identify the room depicted. Painted directly on the wall adjacent to each furniture arrangement are two dimensional installation paintings covered in glass. These paintings are the flattened images of the three-dimensional furniture paintings. They were originally executed with the same oil paint as their corresponding prototypes, and meant to be wet at the time of exhibition.